After the good start at Everton, it was lovely to be home again. The usual suspects gathered at the West Herts to reflect on last week’s performance and what had been a very enjoyable visit to Liverpool. As we approached the ground, the improvements to the outside were apparent and very pleasing to the eye but, as we turned into Occupation Road, there were long queues at the SEJ turnstiles, which made me fear that we’d see the same thing at the Rookery. The other obvious change was that the Bill Mainwood hut had been demolished so Doreen and her friend were at a table out on the street. That’s no way to treat a former Supporter of the Season. The Rookery turnstiles were pleasingly empty so we were quickly in to see the improvements to the concourse which included a series of pictures commemorating great moments in Watford history such as Lloyd Doyley’s debut. I realised that my reaction to these pictures was a little OTT when my niece asked if I was going to cry. It was touch and go! Team news was that there was one change from the Everton game with Ighalo in for Holebas whose position was taken by Anya. So the starting line-up was Gomes, Anya, Prodl, Cathcart, Nyom, Capoue, Behrami, Layun, Jurado, Ighalo and Deeney. 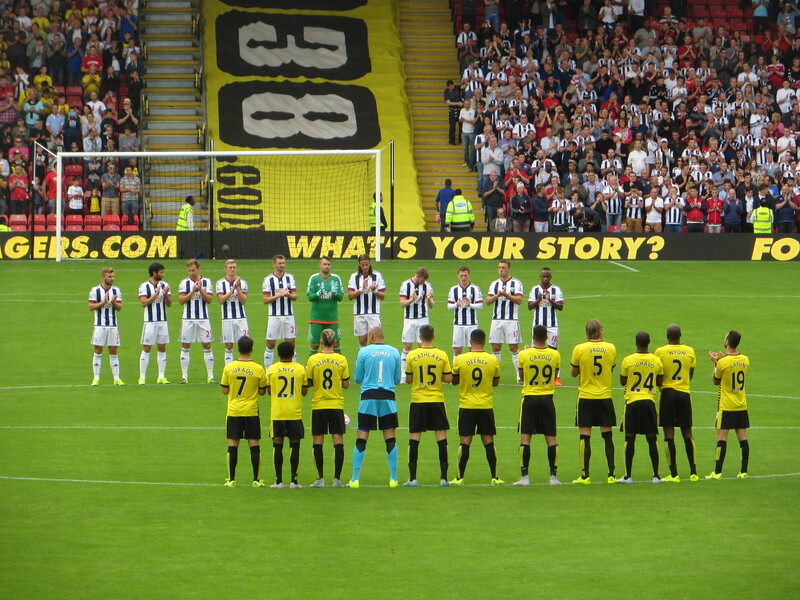 Prior to kick-off there was a minute’s applause for Chris Dyer, a Watford fan who was a victim of the terrorist attack in Tunisia. Watford had an early chance with a shot from distance by Ighalo that was saved by Myhill. It was an encouraging sign. 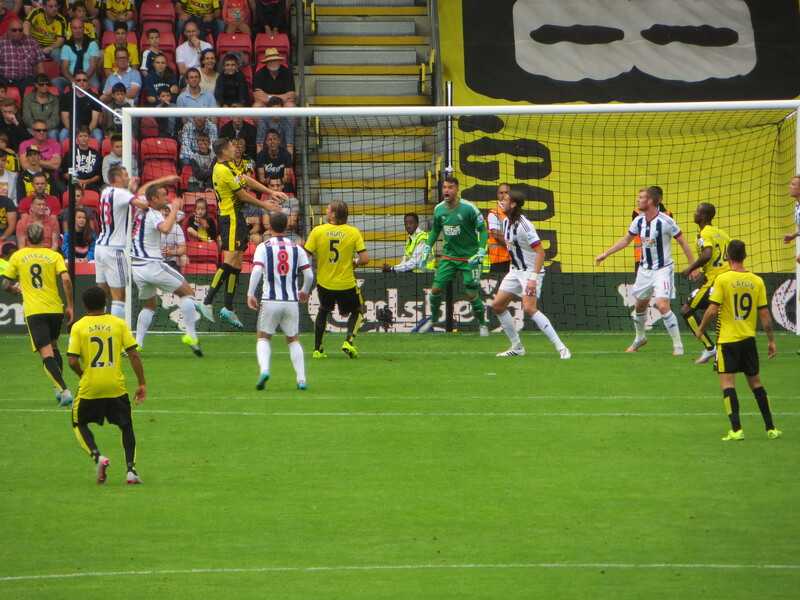 Soon after, a lovely cross from Layun was headed wide by Deeney. Jurado went on a great run down the left, which continued along the byline before he crossed for Deeney whose header was blocked. West Brom’s first attack of note finished with a shot from distance by Lambert which was blocked by Prodl. Deeney received a cross from Capoue and shot goalwards but Myhill was equal to it. Nyom looked beaten on the right but caught his man, picked up the ball and played it up to Capoue who crossed for Jurado whose bicycle kick was high and wide. Another cross into the West Brom box was gathered by Myhill with Ighalo challenging. 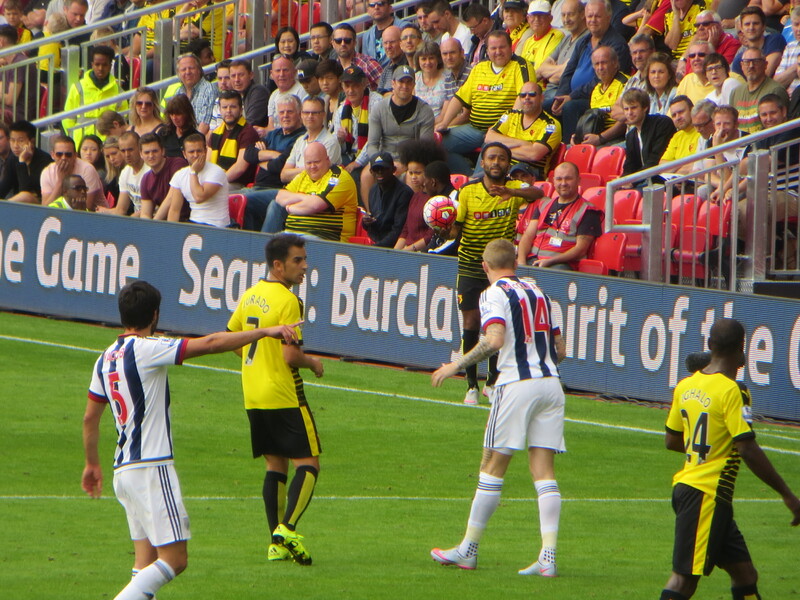 Then Anya played a cross-field ball to Deeney who headed down to Ighalo but the ball was cleared. Just before the half-hour mark, there was a rare foray forward by the visitors. Fletcher’s cross was put out by Nyom. The resulting corner was headed over by Berahino. Another West Brom corner was headed clear by Deeney to launch a counter attack as Anya found Nyom who advanced and unleashed a shot which must have stung the palms of Myhill as he blocked. Ighalo robbed a West Brom player but his break was stopped by a foul from Olsson who was booked for his trouble. Jurado’s free-kick was just wide of the near post. Watford had another great chance to take the lead just before half time as Behrami crossed for Deeney who headed down to Ighalo whose shot cleared the crossbar. Even though we reached the interval scoreless, the half-time analyses in the Rookery were universally positive. It had been an exhilarating half of football with some lovely play. It was just lacking a goal. 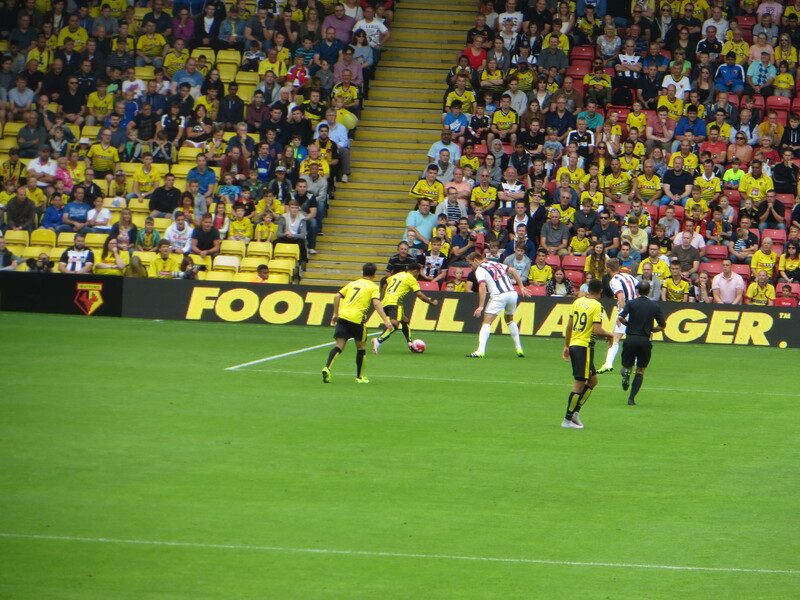 Watford started the second half as they had finished the first. Jurado received the ball on the left, beat two players but shot over. Then Deeney found Ighalo who switched feet before shooting straight at Myhill. Watford’s first substitution came 10 minutes into the half and there were roars of approval as Abdi made his first appearance of the season to replace Layun. A gorgeous pass found Anya on the left, he crossed for Ighalo whose shot was blocked. Just after the hour mark, the Baggies made their first substitution with record signing Salomon Rondon coming on in place of Gardner. He was quickly in action as he advanced up the field before hitting a horrible shot well over the bar much to the amusement of the Vicarage Road faithful who serenaded him with “What a waste of money!” Normal service resumed with another Watford attack as Nyom, who is fast becoming a favourite of mine, made a great break upfield before whipping in a cross which went begging due to lack of bodies in the box. West Brom’s second yellow card went to Lambert for a foul on Behrami (more sinned against than sinner!) Then Abdi played the ball out to Nyom who put in a lovely cross which both Ighalo and Deeney leapt for but neither could connect. Ighalo tried a shot from distance which was caught by Myhill but was going wide anyway. Deeney was the next to try to break the deadlock but his shot was just over the target. With ten minutes to go, West Brom had a great chance to take an undeserved lead as Berahino had a free header following a corner but he directed it wide, much to the relief of the home crowd. Berghuis made his debut with seven minutes remaining coming on for Jurado. 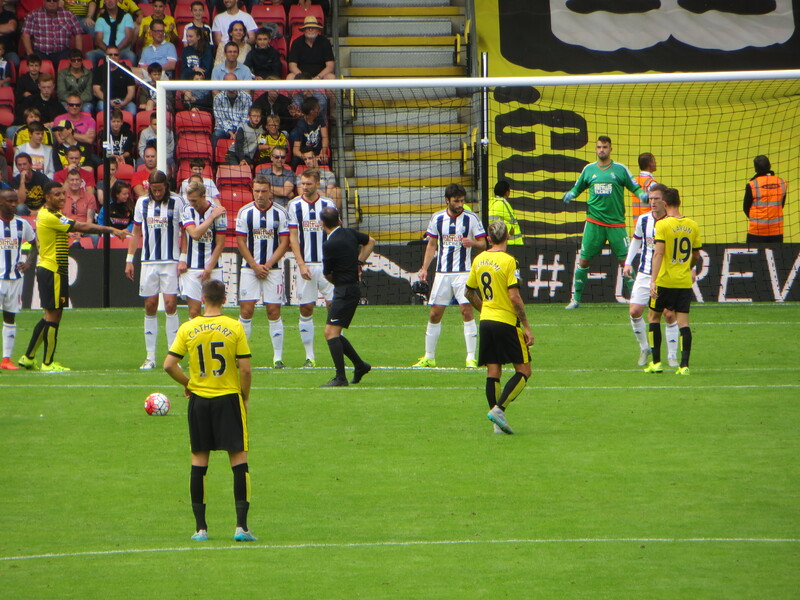 Capoue gave away a free kick on the edge of the box which Brunt wellied over. Watford’s last chance of the game came and went as Anya played the ball back to Abdi who shot straight at Myhill. In time added on, Nyom took McClean down and was booked. A foul borne of fatigue. The final whistle went on a goalless draw that was certainly not lacking in entertainment. I felt a bit deflated at the end of the game. We could have won by 3 or 4 goals while West Brom were the epitome of a Pulis side, dour, negative and time-wasting from early in the game. Their large contingent of travelling fans deserved more from them than a performance in which they didn’t have a single shot on target. As I applauded the team off, my disappointment was tempered somewhat when I heard the bloke behind me say “undefeated”. On reflection, it had been another terrific performance from a team that will only get better. It was rather nice, for the second week running, to want to see us on Match of the Day and to hear positive comments from the pundits. Let us hope that is a feature of this season. This entry was posted in Watford FC and tagged Allan Nyom, Almen Abdi, Boaz Myhill, Callum McManaman, Chris Brunt, Claudio Yacob, Craig Cathcart, Craig Dawson, Craig Gardner, Darren Fletcher, Etienne Capoue, Gareth McAuley, Heurelho Gomes, Ikechi Anya, James McClean, James Morrison, Jonas Olsson, Jose Manuel Jurado, Miguel Layun, Odion Ighalo, Quique Sanchez Flores, Rickie Lambert, Saido Berahino, Salomon Rondon, Sebastian Prodl, Steven Berghuis, Tony Pulis, Troy Deeney, Valon Behrami, Watford FC, West Bromwich Albion FC on August 16, 2015 by franelynn.